Data Assimilation for the Geosciences: From Theory to Application brings together all of the mathematical,statistical, and probability background knowledge needed to formulate data assimilation systems in one place. It includes practical exercises for understanding theoretical formulation and presents some aspects of coding the theory with a toy problem. The book also demonstrates how data assimilation systems are implemented in larger scale fluid dynamical problems related to the atmosphere, oceans, as well as the land surface and other geophysical situations. It offers a comprehensive presentation of the subject, from basic principles to advanced methods, such as Particle Filters and Markov-Chain Monte-Carlo methods. 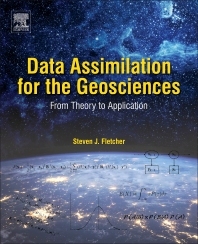 Additionally, Data Assimilation for the Geosciences: From Theory to Application covers the applications of data assimilation techniques in various disciplines of the geosciences, making the book useful to students, teachers, and research scientists. Dr. Fletcher obtained his Bachelor’s degree with honors in Mathematics and Statistics from the University of Reading in 1998. He obtained his Master’s degree in Numerical Solutions to Differential Equations from the University of Reading in 1999. He obtained his Ph.D. in Mathematics/Data Assimilation in 2004, again from the University of Reading. Since 2004, Dr. Fletcher has been a postdoctoral fellow, Research Scientist II, and is currently a Research Scientist III at the Cooperative Institute for Research in the Atmosphere (CIRA) at Colorado State University, where he has worked extensively on extending the Gaussian bases for variational and PSAS based data assimilation methods to allow for the minimization of lognormally distributed errors. He has also derived the theory to allow for Gaussian and lognormally distributed errors to be minimized simultaneously through deriving a mixed Gaussian-lognormal multivariate distribution. This mixed distribution has been applied for 3D and 4DVAR theory, for both full field and incremental formulations. Recently, Dr. Fletcher was able to derive a representer based formulation of 4DVAR for the mixed distribution, which is the basis of NAVDAS-AR, the US Navy’s numerical weather prediction system. The mixed distribution has also been applied in a retrieval system at CIRA for the retrieval of temperature and mixing ratio values given microwave based brightness temperatures, and it was shown that the mixed approach would obtain better fits to the observations compared to a logarithmic transform and a Gaussian fits all approach. Dr. Fletcher is an active member in the Nonlinear Geophysics focus group of the American Geophysical Union, where he fills the role of the focus group’s representative on the program committee for the Annual Fall meeting, which is the largest meeting of geoscientists in the world. Very thorough, informative, and comprehensive book. Went from a total beginner in the field when I started reading to feeling comfortable being at least conversant in all aspects when I finished. Only drawback is the book does contain a number of typographical errors, but they do not detract from the overall learning experience.